When it comes to building brand awareness, there’s many ways in doing so such as handing our promotional products at trade shows or connecting with people on social media. Another great way to build awareness to not only your brand, but to causes and organizations, are promotional apparel! From t-shirts to head wear, promotional apparel is like a walking billboard — hand these top 5 promotional apparel items out to friends, family and coworkers so they can represent your brand loud and proud! Blank t-shirts are probably the most versatile product available — from fashion t-shirts to performance athletic tees. Plus, they come in an infinite combination of styles, colors, fabrics, sizes to choose from! They’re a great way to build brand awareness — as t-shirts are a great gift to give customers, clients and friends. Giving family and friends a custom shirt with your company or non-profit organization’s logo/name on it is free marketing, as they walk around sporting your company proudly. 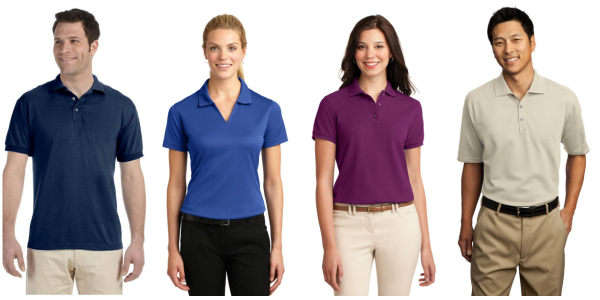 Polo shirts are the go-to for corporate apparel — office attire to the golf course and everywhere else in-between. The best place to incorporate your logo or brand is to embroider your logo or small message on the left side for a professional look. Like t-shirt, there are many different types and styles of polos such as: a regular polo shirt, performance, sport shirts, pique polo, and much more. Nothing says comfort and relaxation like fleece, especially fashionable — yet practical — classic hoodie. Offer your warm regards with comfy-cozy promotional sweatshirts! Take your pick among classic crewnecks, flexible zip-ups or a comfortable pullover hoodie. If you’re going to a professional look and willing to spend a little more, try branded outerwear! 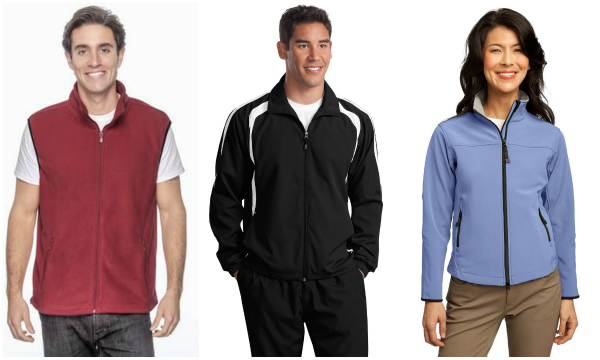 From soft shell jackets to fleece vest, branded outerwear will keep you logo visible through any type of weather. Plus, if kept well, most customers will keep there outerwear for a longer period of time than most branded apparel. Last, but not least, is headwear! They’re great for promoting your brand because your logo can be embroidered or screen printed right at the front of the cap for visibility! Plus, they’re stylish and can be worn all year long. At NYFifth, not only do we sell blank apparel and accessories at wholesale prices but we also do custom embroidery and screen printing on all our products! Get your logo, image or small message on any of our apparel or accessories at a low competitive price. For a free quote, call us at 1-877-695-922 and our customer representative will gladly assist you!